OLDRIGHTIE: Major General Aintworthalight Speaks. More helicopters available says Defence Minister. Followed by tractor stats from Jimmy. Useless. To cheer you up have a look at my blog or Red Rag's. Is that pic to remind us of our fleet of mothballed helicopters that are too complicated to fly ? They are very quiet about that failing, are they not! Sue said... "Half our helicopters are broken"
Did you know that the Battle Of Britain Memorial Flight has a much better serviceability rate than any of the front line squadrons? It's typically better than 90%, and runs on a shoestring budget compared to the rest of the RAF. And the NEWEST one is a mere 64 years old! 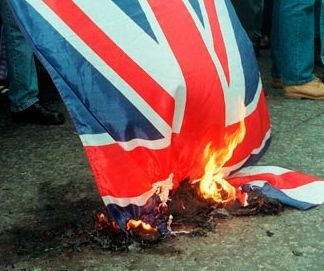 I love The UK, moron. I'm off to welcome our troops home to Hereford. The survivors, that is. I DID LEAVE! I will be back when Labour are dead and gone! First stop will be champers at chez moi, Suzy!